We all know that your GPA and MCAT score are important metrics when applying to medical schools. But it’s your medical school personal statement that makes you truly stand out as a dynamic human being who is more than just numbers. While there’s a lot of opportunity within the personal statement to show who you are, why you’re unique, and why you’re passionate about medicine, there are also a lot of potential mistakes you can make. In fact, many applicants immediately go awry with the first step by selecting poor medical school personal statement topics. I get it. I played a Division I sport in college, and I know just how important athletics can be to your development as a person—particularly when you overcome an injury. And most of the time, this type of experience is one that truly helped you on your path towards medical school. But you need to think about how admissions committee members will read this story. First, tearing your ACL, for example, while horrible and tough to overcome, is not the same as battling cancer or some other life-threatening, long-term condition. In fact, when you do focus on something like an ACL tear, it calls into question whether you understand the full scope of medicine or have the right perspective. Second, know your reader. Not every AdCom member is going to be a sports nut, and even if they are, medical school personal statement topics like this are all too common. A story like this naturally grows boring after you’ve read a couple hundred similar essays. Instead, focus on your personal background and development towards a career in medicine. Think about your clinical experience and patient interactions. Leave the epic sports story for Hollywood to tell. This example goes hand-in-hand with the sports injury. It’s all about putting your experiences in perspective. While your own adversity has, without a doubt, played a role in your development towards medical school, you need to understand the bigger picture. There might be students applying to your schools who grew up homeless or experienced tragic losses in their lives. While that doesn’t mean your personal hardships aren’t meaningful, you do need to understand them in a comparative sense. If you are someone who has experienced significant adversity in your life, work to keep the overall message of your personal statement positive. The emphasis should be on overcoming obstacles and growing in the face of hardship. If you’re someone who has had a stable upbringing, avoid the adversity narrative in which you describe overcoming a challenge. What you’ve faced will ring hollow when read alongside many other applicants in your pool. The personal statement is an incredible opportunity to say something new about yourself. Wasting that space by repeating your activities is a missed opportunity and an all too common mistake. Many students fall into this trap without fully realizing it—mainly because applicants often feel that the personal statement is a place to cover all of their bases. But it isn’t. Focusing on 2-3 main stories or anecdotes as major, developmental moments of growth leads to a much stronger essay. A good way to avoid falling into this trap is to sketch a general framework for how you plan to present yourself in your personal statement first; draft your activities descriptions second; and only then should you draft your essay. If you have already written out your descriptions, you should be able to clearly see the repetition if it arises. Regurgitating your resume will read as an uninspired medical school personal statement topic. While we’re on the topic of not trying to do too much… do not tell your entire life story. Some students have a tendency to try and cram in every major life event they’ve ever experienced into a single essay. The application is not your autobiography. Don’t make this mistake. Medical school personal statement topics that attempt to cover everything you’ve ever done (because you have to do a lot of things before you apply to medical school) will read as completely unfocused. Every applicant has had a long and meaningful journey to get to this point. We don’t need to know every twist and turn! Are you passionate about research? Have you completed a significant amount of clinical work abroad? Did one of your patient-relationships inspire you to pursue a specific field of medicine? Are you passionate about healthcare policy reform? Try to break down your general interest in applying to medical school, and think about highlighting your specific angle through the stories you tell with your medical school personal statement topic. Surprisingly enough, this is a very common mistake we see. For many students, their development towards this point has included exploring different professions, paths, and future options outside of medicine. Choosing medicine in this case would result in having not chosen a different path. While that might not have been the right career for you, it is for many other people, so no need to put it down. The most common example of this is people who switch over from a finance or business track towards medicine. The tendency is for students to assume some sort of moral high-ground for having followed a more “noble” profession. But when you focus on flaws, your application will read negatively. Rather, think about what you learned from your experiences in a different field, and how you can translate those skills towards becoming a better doctor. Bottom line: always focus on the positives. For many applicants, you were first exposed to medicine through your parents. That’s great, but that’s not necessarily personal to you. You don’t want to get caught up talking about how inspiring your parents were when you were growing up. Schools aren’t looking to admit your mom (no matter how great she is). They want to know more about you, your experiences, your perspective on the medical field, your passion for becoming a doctor, and your dedication to helping others. Always keep the focus on YOU with your medical school personal statement topic. 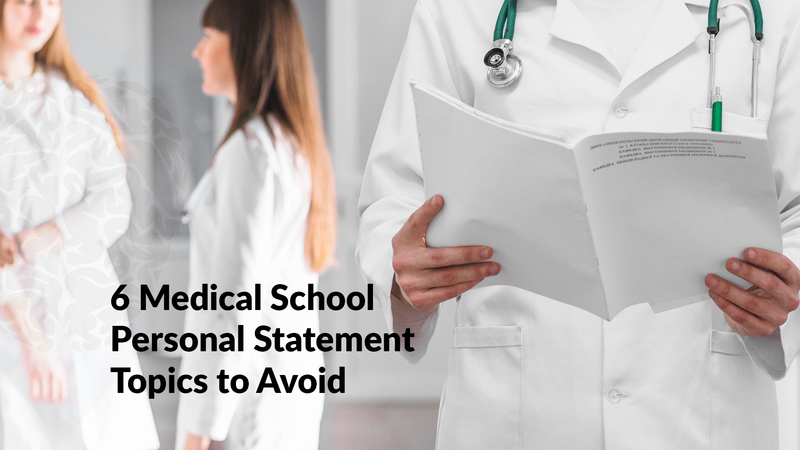 Selecting your medical school personal statement topic is a daunting step! Choosing a strong topic is certainly central to the success of this essay. Remember these tips, but don’t overthink it. Keep it focused on particular stories. Keep it in perspective. And keep it personal.